Technical difficulties cut this episode short. Toppie receives some phone calls and gives thanks to all for his Birthday extravaganza. To hear Toppie’s Birthday celebration on the Ramble Redhead show, click HERE! LEFT click HERE to LISTEN to episode 333 on your computer NOW. RIGHT click HERE to Direct Download episode 333. 3rd Annual Super Spectacular Fourth of July/Gay Pride Extravaganza Special! Sassy, Mr. Angel, Billy Snicker-Snicker, Cricket, Aunt Tappie, Dallas Codey and Roger Bunting join Toppie at a central NY farm to celebrate Toppie’s third annual gay pride/fourth of July celebration extravaganza! LEFT click HERE to LISTEN to Toppie’s 3rd Annual 4th of July/Gay Pride Special on your computer NOW. RIGHT click HERE to Direct Download Toppie’s 3rd Annual 4th of July/Gay Pride Special on your computer NOW. Toppie and friends celebrate St. Patrick’s Day 2013! LEFT click HERE to LISTEN to St. Patrick’s Day Special 2013 on your computer NOW. 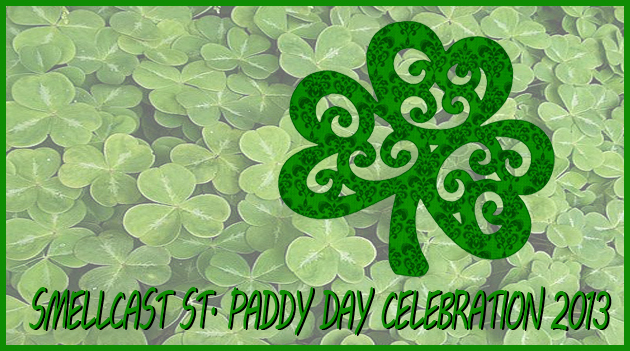 RIGHT click HERE to Direct Download St. Patrick’s Day Special 2013. 2nd Annual Super Spectacular Fourth of July Gay Pride Special! We proudly present our second annual Gay Pride/Fourth of July extravaganza! This year Billy, Cricket, Roger Bunting and Auntie Tappie join Toppie at their friend Peter & Johns’ farm for another fabulous prideful and patriotic celebration!! This episode features answers to long awaited questions about Aunt Tappie! And a few surprises about Billy! Don’t miss this one, folks! LEFT click HERE to LISTEN to episode 277 on your computer NOW. RIGHT click HERE to Direct Download episode 277. 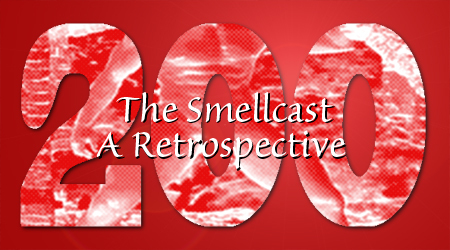 In this retrospective episode, Toppie, Sassy, Walt and Billy take the listeners back to some of the highlights of the past 200 episodes of the Smellcast! The Smellcast is looking for someone to portray Jose Santos (Walt’s beloved) in some future episodes of the show. Do you have a computer and microphone? Can you record yourself and create an MP3 file? Can you pull off a fairly convincing Mexican accent (not looking for a cliche/stereotypical accent — we want an authentic sounding accent!)? You might be the person we need to portray Jose Santos in some future episodes of the Smellcast! We’ll feed you the lines and YOU record them! 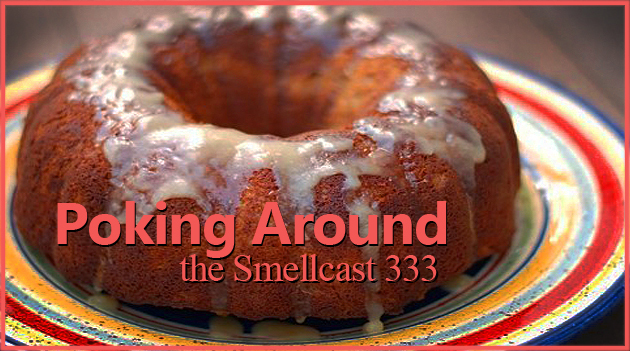 Be part of the Smellcast! Click on this LINK to learn more about it! Click the link below to listen to the Smellcast, episode 200.
sc 1st Annual 4th of July/Gay Pride Spectacular! For the second year in a row, Toppie, Walt, and Sassy spend the Fourth of July at their friend’s farm in upstate NY, attending the biggest gay bash of the year! This year they are joined by Walt’s straight nephew Billy, who challenges some fierce lesbians to a softball game and then dances nearly naked with some hot, hunky, also nearly naked gay men! Meanwhile Toppie does some interviews has a few drinks, and finds himself almost arrested by the police on assault charges! It’s our big FOURTH OF JULY/GAY PRIDE SPECTACULAR!!! And finally, for a few added laughs, you can listen to LAST YEAR’S party by clicking HERE! And this reminder: Don’t look now but August is rushing fast upon us! Act now to sign up for a spot in Toppie’s Big Freakish Talent Show! Click HERE to find out all the details! Click the link below to listen to the Smellcast Fourth of July/Gay Pride episode! The Smellcast 4th of July/Gay Pride Special! sc 2010 Year End Bloopers Special! A special Smellcast presentation of behind the scenes bloopers, blunders and practical jokes! On January first, the Smellcast turns ONE YEAR OLD! 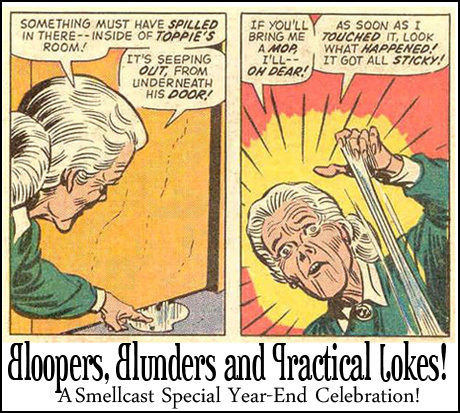 In celebration, we have this Smellcast Special presentation: a Smellcast Blooper Reel! All collected for you in this one hilarious episode! HAPPY NEW YEAR, FOLKS! Write to Toppie at Smellcast@aol.com. Leave a comment right here on Toppie’s blog. Friend Toppie Smellie on Facebook. Click the link below to listen to sc 2010 Year End Bloopers Special! sc St. Patrick’s Day Special! St. Patrick’s Day with a little history, a little music and a few pints. Please send comments to Toppie via smellcast@aol.com. Also don’t miss Walt’s Leprechaun trap — you’ll never believe who he catches in it! Click here to check out Wanda Wisdom ! Please click the link below to listen to our Smellcast Special for St. Patrick’s Day!